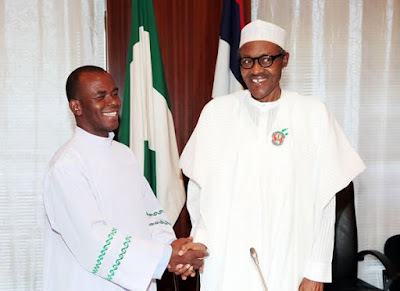 President Muhammadu Buhari on Monday received controversial Catholic Priest, Ejike Mbaka, in his office at the presidential villa Abuja. The cleric, widely known for his outspoken political views, arrived the forecourt of the president’s office at about 12 noon. Rev. Fr. Mbaka backed President Buhari ahead of the 2015 election. He made headlines recently after a video appeared to show the cleric chastising the Peoples Democratic Party’s vice presidential candidate, Peter Obi, for not donating money to his congregation. He made straight to the president’s office complex and was there at the time of publishing this story.